Probably the best Magic: the Gathering toolbox app. Fan made, community oriented. Proudly unofficial. iMtG is probably the most advanced Magic: the Gathering app in the App Store, it has unique Scan function linked to Card Database with pricing, beautiful coverflow views of card lists and decks in Card Database and Deck Builder, and Facebook deck sharing. Life Counter is designed to be easy and convenient to use, yet fully functional. It supports portrait and landscape modes, can run standard, Commander and 2-Headed Giant games. It has full multiplayer support with Commander damage tracking and separate poison counters for 2Headed Giant team. 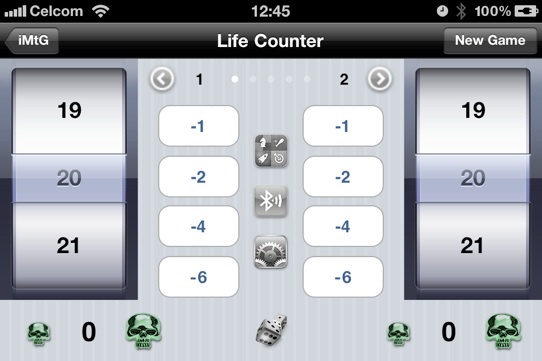 Multiple iMtG Life Counters can be linked over Bluetooth or Game Centre, which is really cool. Life Counter is absolutely free and there are no ads in it. Card Database has up to date pricing and unique collection management. For each card you can set how many you need, own and want to trade. It will add the card to the appropriate report in the main menu. Needed list is especially handy when you are heading for your local shop to do some trading, and you are guaranteed to wow your friends when you show them what you need in a stunning landscape coverflow view. Prices are courtesy of TCGplayer.com, displayed in configurable currency and multiplied by configurable factor, so you can adjust for your local market. Deck Builder includes sample play / fish tool, mana statistics, export by Email and sharing on Facebook. You can use Import from iTunes function to upgrade from other MTG deck builders which support .dec file format. Gathering is our forum where you can share your decks, show off your collection, trade your cards, ask pros about rules, or simply discuss Magic and life in general. Gathering is linked with Multiverse, a geolocation system which, if you join it, will show you locations of players who also joined. Please note the Support and Feedback option, the use of which I would greatly appreciate. Before giving iMtG a review of anything less than 5 stars, please contact me either via Support page or directly from the app and I'll make sure your problem is resolved. No support email is left without a reply! Bad news: the scanner will only work with iPhone 3GS and 4, as other cameras will not focus close enough. You will have a chance to see for yourself as free trial is included. Try before you buy! iMtG is owned by chattyhome.com and is not affiliated with, endorsed, sponsored, specifically approved or authorized by Wizards of the Coast LLC.